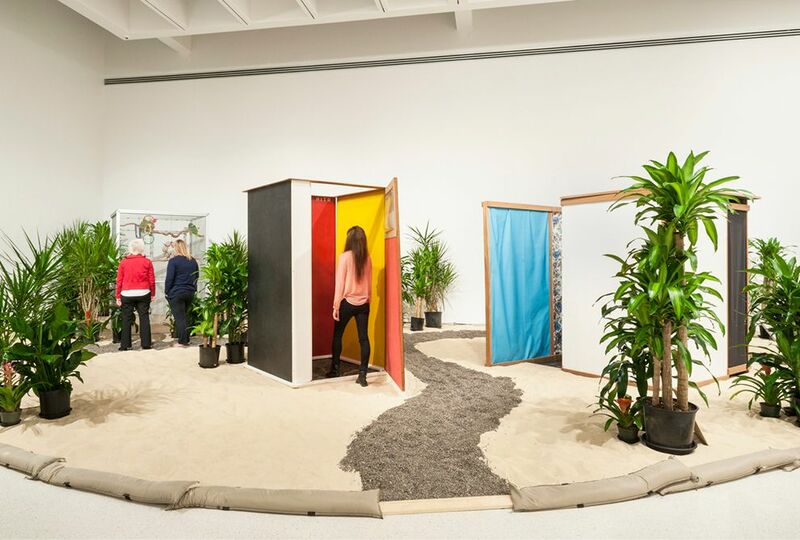 Tropicalia, from 1967, is “likely the most startling and memorable installation here,” said Ben Davis in ArtNet.com. A beach tableau complete with sand to walk in, potted banana plants, two live parrots, and a couple cabana-style booths, it parodies the Brazil of tourist brochures but also the idea of a Brazilian soul. Writing on one cabana wall reads “Purity is a myth.” After the installation appeared in a Rio de Janeiro museum, its title was adopted as the name of a larger countercultural movement, linking Oiticica’s broader effort to redefine the viewer’s relationship to art to a wider resistance to Brazil’s post-1964 military regime. Even now, the historical context in which Oiticica produced his work is “very, very important to its magnetism.” His various invitations for viewers to cut loose, including the Afro-Brazilian style capes he created for museumgoers to dance in, seem more charged when you know they helped generate the notoriety for Oiticica that pushed him into exile—first to London, then to 1970s New York.